Are you wanting to have artificial grass installed? Did you know you could install it yourself? No really, DIY is not hard! Firstly, visit our showroom to chat with us about what exactly you are looking for. There are many different types of artificial grass and we supply a variety of options for you to choose from. Order the grass that you want, and we will deliver it to your address, or you can it collect from ours, or take it home with you right then and there! Once you have your grass with you on your property, you will need to begin by preparing the area. Clearly mark the area where you will be installing the artificial turf. Remove any existing growth or landscaping such as grass, weeds and extra soil. When clearing the area, make sure you allow for at least 60mm depth. A thicker blue metal dust base will create a stronger base. For residential use, 60mm to 70mm is suitable. If the space is intended for car parking, the base needs to be at least 150mm thick. Apply the stone aggregate (blue metal dust) to the area and use a rake to smooth out the stones. Screed the aggregate until it is level to ensure proper drainage. Spray water on the stone aggregate and compact until the area is firm and even. Roll out each section of artificial turf over the prepared areas and make sure all pieces have the yarn lying in the same direction. Mark the location of the seam before pulling back the turf to expose 30cm of the crushed aggregate. Roll the joint tape down the seam before applying adhesive onto the joint tape and lay the pieces together. Apply pressure to the seam to ensure it is firmly connected. Place a long nail or U-shape pin every 30cm to 50cm to secure the turf. 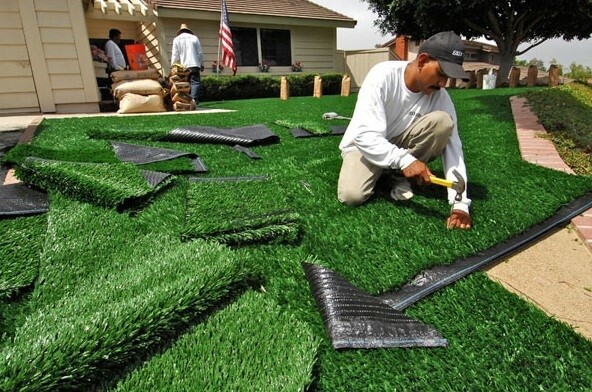 To make the turf fit the area, trim along the edges. Apply the infill (whitewashed sands) and use a power broom or lawn broom to smooth out and seal the lawn. We recommend a white sand infill of 5kg to 15kg, depending on the type of turf, to every square metre of our artificial turf. As the density of our products is high, no rubber granules or additional sand is required. For your further convenience when DIY’ing it, we now have a compactor and a power broom available to hire. We also have a free loan trailer for up to four hours too. Last, but not least, we have added joining tape and U-shaped pegs for sale in our accessories section. Visit our products page for more information. If you are still unsure or have any questions, please chat with us. We are happy to help! O'CONNOR, Western Australia, 6163, Australia.